If we’re storing your Recreational Vehicle for you here, we hope to see you take it for a spin this summer. Traveling by RV in the summer is a top vacation activity for people of all ages and stages. From families to a guy’s weekend, going by RV almost always ensures a great time. In summer, there are a few safety precautions you can make a note of to make your time the most enjoyable. 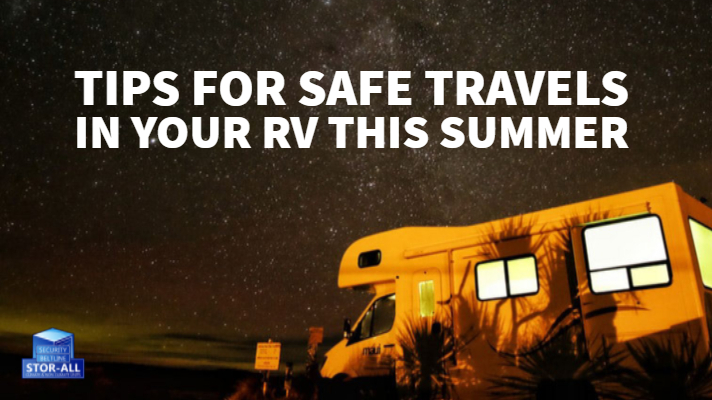 Here are a few tips for safe travels in your RV this summer. Plan and outline your route plenty in advance of your trip. If you use a map app, be sure it is the most updated version. Detours and road construction are important to know ahead of time so you don’t find yourself rerouted, frustrated, and behind schedule with unforeseen traffic changes. Traveling in summer can be harder on the driver than other months. The heat of the day and harsh sunlight through the windshield can speed up driving fatigue. Plan ahead who your driving partner will be. Switch off regularly, take a nap or just rest. While this one may sound like good old common sense, electrical circuits in an RV can deteriorate from year to year or from season to season. Even if you just took your vehicle out on vacation over the winter holiday break be sure to do a thorough run-through of all electricals before setting out on your summer trip. Especially when you’re going to be traveling in the hot summer months, you’ll want to be sure the air conditioning is still up to speed. Whether your plans are short or extended, being caught with unexpected electrical issues is no laughing matter. What is the #1 cause of RV accidents? Be sure to know exactly how high and how wide your RV is. Did you know that hitting bridges and overhangs are the number one reason for accidents in an RV? Get an accurate measurement of your vehicle so you will know exactly what bridges, overhangs, and overpasses you need to go around. Go a step further and write down these measurements and place them where you will see them daily. Be sure to stay safe and secure in your RV this summer. How can you do this? RVs are especially vulnerable because you’ll often park in an RV camp with that increased visibility. The first rule of thumb is to keep any flashy items out of public view. Pricey electronics, clothing, jewelry-items like this can be locked in a safe inside the RV if not being worn. You keep the key. Next, keep all windows and doors locked when at all possible. Finally, you may want to install a security system or security cameras. Cameras being visible are a good deterrent to potential thieves. 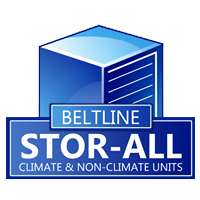 If you have any questions about available storage space for household items, appliances, boats, or RVs, contact Stor-All today. We provide all types of solutions for home and business owners in Mobile, Alabama and the surrounding areas. Call us today at 251-343-6999 and reserve your storage unit! Check out Beltline and Security on Facebook, or visit us online at www.StorAlls.com!